The Halloween Hermit Crab, with its vibrant orange and red banding, stands out as a member of your aquarium cleanup crew. Originating from the Hawaiian Islands, the Halloween Hermit Crab boasts attractive color variegation and is a beautiful accent to the marine aquarium. 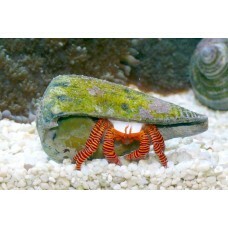 The Halloween Hermit Crab is a very useful aquarium cleaner that helps maintain a healthy aquarium environment by eating any left over food that may settle on the substrate. Adding further value, the Halloween Hermit Crab is known to efficiently eat algae including green hair algae and cyanobacteria. It also provides a valuable service of aerating aquarium substrate by sifting through the sand. Be aware that as the Halloween Hermit Crab attains a large size, this lumbering scavenger may disrupt rockwork or corals in reef aquariums. The Halloween Hermit Crab lives in abandoned snail or triton shells and may resort to attacking and eating a snail so it can use the shell for its home. To prevent this from happening, provide the Halloween Hermit Crab empty shells of assorted shapes and size.